Does This Apple, Inc. Stock Recovery Have Legs? This bull wouldn't bet on it. 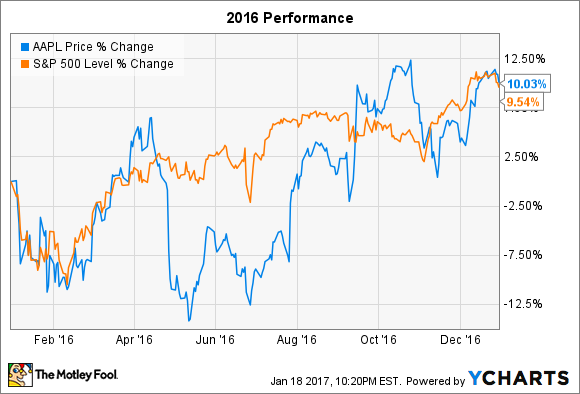 Following a lackluster 2016 that saw Apple (NASDAQ:AAPL) just barely squeeze out some outperformance relative to the S&P 500, shares now seem to be recovering from the negativity. It's worth noting that Apple did spend much of last year underperforming the market, including the final months of the year. The Mac maker only pulled ahead in the last couple weeks. Shares are now trading in the ballpark of $120, levels not seen through all of 2016. Investing is a forward-looking endeavor, so the real question is: Does this recovery have legs and will shares continue higher, or will shares gyrate lower and we're now just seeing the top of range-bound trading? Last year marked the first time that Apple posted year-over-year declines in iPhone unit sales, both on quarterly bases as well as for the full fiscal year. Considering the importance of the iPhone to Apple's financials, that's an incredibly tough storyline to beat. Apple investors in particular are known to be an emotional bunch, and investor sentiment is a function of emotion. It also didn't help that Apple Watch -- along with the broader smartwatch market -- is already suffering from weak demand and likely year-over-year declines in unit sales, too. The iPhone 7 was not a game changer. Image source: Apple. The skepticism only fueled the idea that Tim Cook's Apple can't innovate in the same way that Steve Jobs' Apple could. Just this week, a former Apple engineer argued that Cook changed "Apple from a dynamic change-maker into a boring operations company," among other critical comments about Apple's direction and ability to innovate. I'd agree that Apple is a lot more boring these days, but I don't think focusing on operations is necessarily a bad thing. Execution and operations are intimately linked, and don't forget how nearly all of Apple's pertinent operating metrics -- including iPhone unit sales and revenue, among many others -- have skyrocketed under Cook's leadership. Those gains are more attributable to strong execution than revolutionary new products. Don't get me wrong; I've long been the Fool's resident Apple perma-bull, and Apple remains one of my largest holdings. But in my opinion, it seems likely that Apple shares will remain range-bound and we may simply be near the top of that range. I've noted a significant disconnect between the buy-side and the sell-side, which I attribute to poor investor sentiment on the part of the buy-side. The sell-side has less skin in the game, and lofty price targets are often derived by using comparable peer valuation multiples. If Apple stock is to really rise meaningfully from here, the company has to overcome the prevailing perception that it has lost its innovative touch, which would subsequently inspire investor confidence. Maybe then the market will price in higher valuation multiples. The problem is that disproving the skeptics takes a long time. And lacking any revolutionary breakthrough products in the short-term pipeline (i.e., in 2017), the company doesn't have many other ways to prove them wrong.